This series on the Emeq HaMelekh is a continuing look at the Mishnahs that describe the roles of five worthy men, Shimur Ha Levi, Haggai (Chaggai the Prophet), Zechariah son of Iddo, Zedekiah (Zidkiyah), Hezekiah (Hizkiyah), Hilkiyah, Ezra the Cohen, and Baruch son of Neriah the Scribe for Jeremiah who were commissioned on a secret mission to hide the treasures of Solomon’s Temple. The mortality rate was over 50% of the 230 plus priests and other men noted as worthy who were entrusted in this clandestine mission to put the furnishings and vessels of the Lord into long term hiding. This Mishnah had breathtaking significance seeing the mortality ratio of the Jews that hid these precious artifacts in that they were hidden in a tower in the land of Babylon in the ancient city of Bagdat (Baghdad). The documentation of this hunt for these treasures continues to this day by the rabbabim and has significant subterranean impact in the War against Saddam Hussein in the Nation of Iraq. Within this cache of treasures, we have a description of the gold and silver bread molds, which give us visual insight into the awesome perfection and specificity of how the Lord of hosts wanted his services to be performed. We will go through a study on bread molds and bread baking ovens in the ancient world of the Egyptians, Syrians, and the Hebrews. The Hebrew Showbread or the Bread of Presence was special to the Hebrew temple service in which the Family of Garmu of the Kohathites became the nationally recognized specialists in Showbread baking. Weekly the fresh showbread was placed on the Table of Showbread along with Frankincense to be used on the Altar of Incense. What was even more spectacular was that the gold and silver bread molds were encrusted with Margaliot pearls and precious gemstones. The story of David’s ascent to kingship is specifically related to the showbread when he was fleeing from the long arm of King Saul’s assassins and he and his men were given showbread to eat by the High Priest Ahimelech. This resulted in the death of the high priest, yet his son Abiathar fled and Abiathar was soon anointed as the high priest by King David. Also in Baghdad are to be located thirty-six golden trumpets and the most magnificent specimen of one of the furnishings in the golden lined, gemstone encrusted Holy Place in the Temple of Solomon, an awesome 49 lamped menorah encrusted with upwards to 182 precious gemstones and 36,400 jeweled stones. 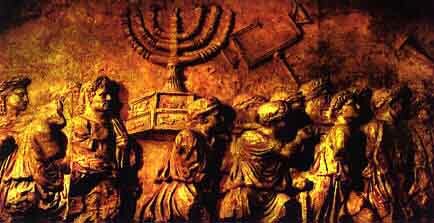 Yes we do have an eyewitness in the Bible of this menorah as we look at it through the eyes of Zechariah the Prophet son of Ido. The Menorah was the only source of lighting in the Sanctuary and the Temple. It represented the Glory of God, the seven pipes the eyes of Jehovah, the presence of the Holy Spirit in the lamp oil and a portrayal of the coming messiah (Moschiach) in the life of Jesus (Yeshua), son of Yosef, brother of Jacov (James or Jacob). The preparation for the coming of the anointed one, the messiah (Moschiach) was in the rededication of the Temple of Zerubbabel by the Maccabees, when the golden menorah was abducted at the desecration of the temple during the Abomination of Desolation by Antiochus Epiphanes IV. At this time the festival of Chanukah was instituted, the eight lamped Hanukkah menorah was first made and the Festival of Lights started the Essenes in preparation for the coming of the Moschiach. The temple Menorah in Solomon’s Temple represented the solar system and the planets known to the ancient world. The almond shaped lamps first made by Bezaleel for the Sanctuary of Moses (Moshe) was a shadow type of Yeshua (Jesus) hanging on the almond tree on the Mount of Olives, when upon his death the Ner-ha-Ma-arabi (Ner Elohim), the Western Lamp quit burning in the Temple during the time of the high priest of Simeon Tzaddik, the Righteous, the crimson cord failed to turn red, and the great temple door, called the Hekel refused to close during the forty years before the fall of Jerusalem in 68-70 CE. We will then trace the route of one of Herod’s Temple menorahs that was captured by the Roman forces and the portrayal that was engraved on the triumphal Arc of Titus. The modern investigation and request by the National of Israel to the Holy See to return the menorah and other temple artifacts from the archives of the Vatican will be documented. Of the Levites, 130 were killed and 100 escaped with Shimur HaLevi and his companions. These [men] concealed 500,000 trays of fine gold, and 1,200,000 of silver; 500,000 bread molds of fine gold, and 1,200,000 of silver. On each of the molds, there were 5 Margaliot (pearls?) and 2 precious gem stones. The value of each precious stone was 100 talents of gold, and the total value of all the Margaliot was 200,000 talents of gold. There were also 36 golden Trumpets. All of these were hidden and concealed in a tower in the land of Babylon, in the great city called Bagdat. [There was also a 7-branched] Menorah of fine gold, [worth] 100,000 [talents], with 7 lamps on each [branch], 26 precious gem stones on each Menorah, each Margalit (pearl? gem?) priceless, and between every gem stone, 200 [smaller] stones, also priceless. The incredible numbers in the Mishnayots - As a Bible Searcher, we have always had a tremendous respect for the authors who wrote in the ancient times. If they stated a historical fact, then we are inclined to believe the facts as stated. The facts of the Emeq HaMelekh are not hard to fathom if you have a good understanding of all the myths and legends of the fabulous wealth of King Solomon. Standing at the crossroads of the worlds when there was a vacuum in political power from the east to the western worlds, suggests that the wealth of the nations could have flowed to Jerusalem. This was a spiritual revolutionary force at work... Dedicated, brave and stealthfully these Judaites did their assigned mission. Mission Impossible? No, but the mortality was high. One hundred thirty of at least two hundred thirty five trained commandos gave up their lives for the preservation of the future and end time resurrection of the Mishkhan or Sanctuary of the Lord. One of the great Israeli experts on the lost Temple treasures is Rav Menachem Borstein. Moshe Notzar published an article in the Yibane HaMikdash 108, which had been originally published as: “Yom HaShishi” 8 AV 5763 and later republished in the Temple Mount Recent Development in the News about October, 1996. In this article, he told about Rav Menachem Borstein, one of the great Israeli experts on the lost Temple treasures, who had been searching for the hidden vessels from Solomon’s Temple. As a national expert on ancient manuscripts, he was one of the key experts who identified the Copper Scroll that was in the Archives of the National Museum in Akkaba, Jordan and was instrumental in getting the Jordanian government to entrust the scrolls to a Professor Kandi, an expert in decoding hidden messages in ancient scrolls. Here then lies one of the revolutionary secrets of the ages. Saddam Hussein, the modern Nebuchadnezzar of Babylon, has been sitting on top of some of the greatest archeological treasures of the Temple of Solomon, objects that would obviously be a national treasure to the Nation of Israel and could cause a major geo-political shift in Moslem-Israeli relationship if they were revealed to the world public. With the War on Terror that challenged Hussein’s right to inflict indiscriminate evil against the people chosen by God and the land of Israel, the Lord of hosts may be opening the way for the fulfillment of the restoration of some of the temple artifacts that belong in the Temple of the Lord. It is possible that Iraq will once again come against under the influence of the western powers and be open to the investigative shovel of the archeologist. Here within the land of Babylon, concealed in a tower in the city of Baghdad, are treasures of immense value whose religious heritage may shatter the power of the evil perpetuated by the children of Ishmael. The site some scholars presume to be the ancient city of Baghdad is the ancient city of Opis on the eastern bank of the Tigris River. This city was called Upî or Upija in Akkadian was first known in ancient geography about the time of David and Solomon in Jerusalem. It was the site of an ancient ‘royal canal’ between the Tigris and the Euphrates and also at the end of a long wall built as a protective shield against the Median invaders by Nebuchadnezzar. 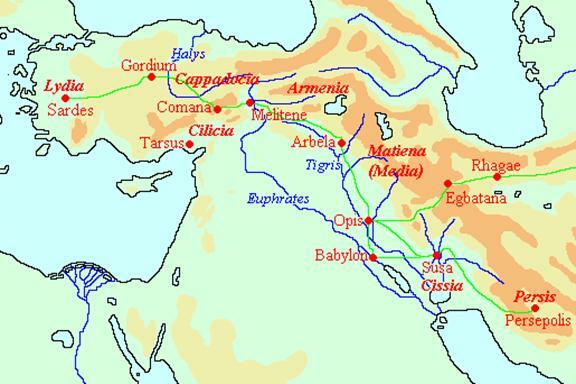 The city of Opis was connected along the commercial roadway between Susa in Elam and also situated on the so-called Royal road, which connected central Assyria with the Elam capital of Susa then on to Sardis the capital of Lydia. What became of Opis during the Persian empire is unknown. The whole city was massacred by Nabonidus and recovery could have been real slow. Yet Opis has one other claim to fame in the rise and fall of the ancient empires. On August 324 BCE, the forces of the Macedonian conqueror of the Middle East, Alexander the Great came to a standstill at the city of Opis, when the Grecian soldiers mutinied against him because they felt he was giving equal rights to the Persians. 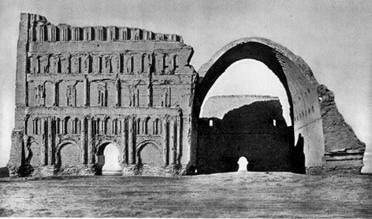 The Palace Ruins of Ctesiphon built by Chosroes I, the Sassanian ruler. It was near Baghdad that the Syrian general Seleucid, one of Alexander’s four generals who split up his empire after his death, decided to build his new capital, Seleucia. It soon became a major trading center in the Mesopotamian valley. Right after the Maccabean defeat of the Syrian ruler Antiochus Epiphanes IV, the city was destroyed and nearby on the other side of the Tigris, a new city which was growing, Ctesiphon, which became the center of trade with the Asiatic regions of the world. It is near Ctesiphon that modern Baghdad was erected by the Abbasid Caliph al Mansur in 763 CE, who called it the “Garden of Dat.” In the site of old Ctesiphon, the remains of the ancient city walls are still visible plus the remarkable palace with vaulted ceilings. So did Baghdad, or Bagdat, as the Emeq HaMelekh called it exist during the time of the Babylonian ruler of Nebuchadnezzar? By all indication from history and archeology, the answer is yes. This inventory of treasures has some of the most magnificent furnishing within it. · A 7 branched, 49 lamped Menorah in fine gold with 182 precious gemstones (26 per each of the seven branches) surrounded by 36,400 jeweled stones (200 for each 182 gemstones) imbedded around the priceless gemstones. Can we imagine what a golden Menorah with 49 lamps would look like? It would be one of the most exquisite candelabras known throughout the history of man. Seven branches with seven lamps on each branch. All of them have golden pipes coming from one common oil reservoir. Now consider the beauty of a beautifully carved lamp stand in which each branch on the candle had twenty six gemstones, faceted and engraved embedded in the gold. Then embedded around each of the larger gemstones were 200 additional micro-gems of various array of color, yet all sparkling and dazzling in a light display as the intense light from the combined lumens of the 49 lamps bounced off the walls of the Holy Place in the Temple reflecting a golden sheen of “red gold” from the Parvaim district of India and then were reflected in a dazzling display of iridescent and sparkling beauty as the light refracted from the thousands of gemstones embedded in the walls of the Holy Place. Earlier we noted that one silver trumpet was hidden with the furnishings of the Sanctuary of the Congregation, yet the value of the silver trumpet could have been more valuable than the golden trumpets because, as in Egypt, the rarity of silver made its value more valuable than gold. Here though are 36 golden long single barreled trumpet used in the call of the Shofar from the temple walls to worship the Lord of hosts. We’ve already discussed the golden bread molds and how they were unique to bread making in the Levant. Showbread baked in gold and served on a golden table of showbread was what the standard of beauty and quality that was expected to be given for the Lord of hosts. Yet this passage takes beauty to a new dimension. Here we find a description of five margaliot pearls or precious gemstones embedded on each mold and that is not discussing the intricate beauty of design that no doubt was engraved on each bread mold. The following calculations of the value of the precious relics valued in talents of gold will be using the more conservative estimates of decreasing the numbers by a factor 1000. At 75 pounds per talent and $340.00 per oz. of gold, (1 oz gold = 31.1 grams = 0.02 pounds). · 1,200,000 (1,200) silver bread molds, each embossed with 5 margaliots (margalit = Latvian mirgot, mirdzaloti "shine, shiny, sparkling, glitter" or pearls or pearly cabochons?) and 2 precious jewels. The silver bread molds were made to the same exacting measurements as the golden one. What was the reason for producing bread molds of silver is not known. Were they used for different purposes or for different functions? Whereas the intrinsic value of the silver bread molds was less precious, the value of the jewels that were embedded on the silver molds was no different. On each of the golden and the silver bread molds were five Margaliots, 2,500,000 (2,500) Margaliots on the golden bread molds and 6,000,000 (6,000) Margaliots on the silver. According also to the Mishnah there were two gemstones on each of the gold and silver bread molds. This would make 1,000,000 (1,000) precious gemstones on the Golden Bread Molds and 2,400,000 (2,400) precious jewels on the Silver Bread Molds. According to this Mishnah, each gemstone was valued at 100 (0.1) talents of gold. As such the entire hoard of gemstones would be valued on today’s gold market of $340.00 at $4.335 million dollars. · 500,000 (500) trays of gold. These golden trays were more than likely used to carry and stabilize the bread molds as they were placed on the tables of showbread. · 1,200,000 (1,200) trays of silver. These silver trays were more than likely had the same utilitarian function as the golden trays. The weight in talents of gold or silver is not known for either of these temple vessels. Before we move on, let us take a breath of fresh air. The archeological discovery of this cache of valuable vessels, the trumpets and the golden menorah would rival the discovery of King Tuts tomb in Egypt. Can we even comprehend the beauty of the dazzling 49 lamped menorah hidden in the ancient city of Baghdad, or Opis, that is studded with gemstones whose worth is without measure? What about the thirty six golden trumpets? For professional the musician whose musical interest is in understanding the differences in the trumpets of the ancient world with modern day trumpets and cornets and the differences in the tonal quality between gold and silver trumpets would invaluable to the history and science of musicology. It would be fascinating to have an account of an internationally recognized trumpet player to describe the differences in the beautiful tones as played on a pure golden trumpet and a pure silver trumpet. It was earlier suggested that in the inventory where the Mishkhan, the Sanctuary and the Ark of the Covenant were hidden there was a silver trumpet and due to the proximity to the Land of Egypt and the hoards of gold in that land of antiquity, that silver was a rarer commodity than gold. Yet, in looking at these hoards, it suggests a rarity of 5:12 ratio which depicts gold still being the rarest of the commodities. Present modern calculations put this same ratio at a 1:10 ratio, which does state that silver was rarer even in the ancient days, but like today, it was recognized to be an inferior precious metal. Also in the same hoard with 500,000 (500) golden bread molds and 500,000 (500) trays to match. These are the trays and molds that held the sacred bread, called the Bread of the Presence, because it was placed on golden tables in the Holy Place of the Sanctuary and the Temple of Solomon before the presence of the Lord of hosts. 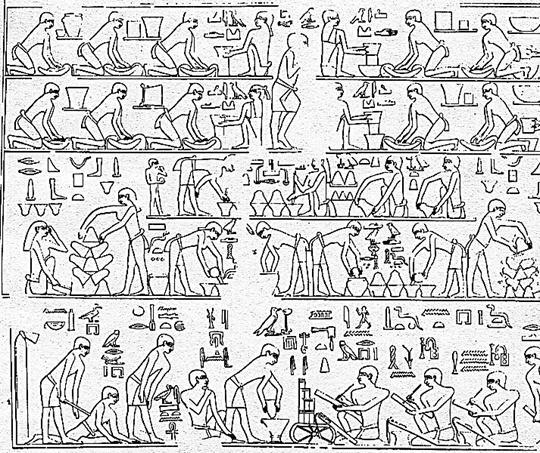 The Children of Israel were fresh from their escapade from the land of Egypt and now at the foot of the mount called Sinai, Moses was instructing the artisans and craftsmen under the tutelage of Bezaleel were to make bread molds of gold and silver to place in the Most Holy Place before the presence of the Lord of hosts. The bread first had to be baked in outdoor ovens and then the sacred bread made specifically for temple services and later to be eaten by the Levites, was placed on golden tables, with golden trays upon which the bread fresh from the ovens were molded with golden bread molds. My first impression that the bread molds must have looked like a giant butter dish as our modern bread is shaped oblong. 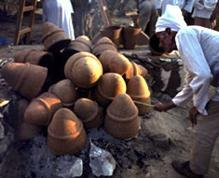 In 1993, Mark Lehner, director of the Gaza excavations and archeologist at the Harvard Semitic Museum and the University of Chicago plus a National Geographic team built a replica of a Pyramid Age bakery, with bread molds in large, conical ceramic molds weighing up to 12 kilograms called a bedja. 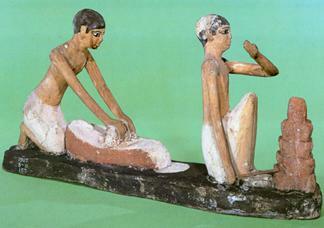 With the assistance of Ed Wood, an international expert of yeasts and sourdoughs, they uncovered evidence of bread making unique to the Old Kingdom in the tombs of Pharonic Egypt, such as that of the 5th dynasty official Ty at Square. It is this era that this author feels more replicates the era of the Exodus. Shards found of bread molds of this type are found dotting the landscape all the way to Palestine. Using the life studies of Ed Wood on wild yeasts and the sourdough bread made from the flour of emmer and barley, Ed used local wild yeast from Gaza to leaven the bread found in the ancient bread baking sites at Giza and rebuilt a replicated oven at Saqqara. The adaptation and sophistication of the Hebrew bread making quickly changed as they moved into Palestine and became acquainted with the Canaanite method of baking bread. Whereas the Egyptians made bread with only emmer and barley, wheat was also introduced in the repertoire of breads, because it has gluten which makes it finer, lighter and fluffier. The bread eventually developed away from thick loaves to thinner cakes, in the post exilic era. 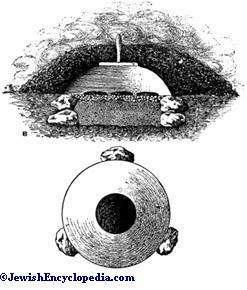 The oven of the Syrians, Canaanites and no doubt the Israelites of the Judge’s era, was a clay cylinder, narrower at the top in which fire was kindled beneath and cakes were stuck on the interior heated walls, while the Egyptians laid the cakes on the exterior walls. This bread making would have been the common variety of bread in which the Children of Israel would have made bread, but was not necessarily how the Lord of hosts wanted the bread that was to be place before his Presence in the Holy Place. The sons of the Kohathites (1 Chron. 9:32) were in charge of baking and presenting the “bread of the row”. We remember the story of David fleeing from the presence of King Saul, presented himself with his men famished for food at the city of Nob to Ahimelech, the high priest, and was given the week old ‘holy’ bread from the Sanctuary. (1 Samuel 21:4-6, Matt. 12:4, Luke 6:4) For this act, the family of Ahimelech lost their lives, leaving only his son Abiathar who escaped. Yoma iii. 11, 38a; Tosef. Yoma, ii. 5 - "Our forebears communicated to us their premonition that the Temple would eventually be destroyed; should we instruct others in our art, it might come to pass that our pupils would exercise the art in the service of some idolatrous temple." History would remember the Garmuites with reverence as model Israelites of scrupulous honesty. Each loaf of bread was kneaded singly but baked in doubles. According to the baking instructions in the Jewish Encyclopedia, the golden molds or forms were used throughout the entire baking process. The loafs or cakes according to the Mishnah (Men. xi. 4; "Yad," l.c. v. 9), were ten fingers (Maimonides gives "palms") in length, five in breadth, and rims, or upturned "horns," of seven fingers in length. To the modern baker, considering the fact that solid gold dishes, pans, utensils, and implements were used in the cooking and baking process gives a different flavor to gourmet cooking and baking. According to the Torah, twelve cakes, each with two-tenths of an ephah of fine flour, were placed on a ‘pure’ table and remained exposed to view for an entire week in the presence of the Lord. As such the ‘showbread’ was called ‘the presence-bread’. Each Sabbath, the new bread replaced the older bread in two heaps with one loaf leaning against another. The cakes that were removed were placed on a golden take in the hall as the bread itself was holy and not taken out of the temple premises. After the incense was burned the cakes were divided among the Levites. If Yom Kippur, a fast day, fell on the seventh-day Sabbath, the division of the bread was delayed until after the setting of the sun. ("Yad," l.c. v. 5). According to Josephus on top of each heap of bread, six to a heap, was placed a golden cup of frankincense which was a memorial, ‘azkarah’ that was to be used on the altar of YHWH. (Leviticus 24:4-9) It was at this altar that Zechariah, the priest was offering incense to the Lord when he was met face to face with Gabriel the Archangel, announcing the birth of his son, John the Baptist. According to the Tosefta, Men. xi, the cups holding the frankincense, called ‘bezikin’ had flat bottoms or rims so they could be balanced on top of the heap of bread. The frankincense was then burned in the sacred fire and a new supply was placed with the fresh loaves of bread. (Josephus, Antiquities, iii. 10, § 7). The Menorah that was hidden under the supervision of the five Jewish guardians of Solomon’s Temple depicts a description of a majestic lamp of such glory that has not been revealed in any other literature. Here we see a golden lamp from the Temple of Solomon, which according to its size and the embellishments appears to be solid cast gold. The menorahs of the ancients Israelites were depicted as a seven branched lamp, yet this menorah had 7 lamps on each branch, a total of 49 glowing oil lamps. Menorah for the Sanctuary - Let’s first revisit the Menorah made for the Tabernacle in the Wilderness built by Bezaleel. "Three bowls made after the fashion of almonds in one branch, a knob and a flower; and three bowls made like almonds in another branch, a knob and a flower: so throughout the six branches going out of the candlestick. "And a knob under two branches of the same, and a knob under two branches of the same, and a knob under two branches of the same, according to the six branches going out of it. "Their knobs and their branches were of the same: all of it was one beaten work of pure gold. "And he made his seven lamps, and his snuffers, and his snuff dishes, of pure gold. "Of a talent of pure gold he made it and all the vessels thereof"
In the Antiquities of the Jews by Flavius Josephus, he makes a description of the Menorah that was crafted by Bezaleel under the supervision of Moses. The Menorah was a symbol of our solar system, created in seven days, in which the center is the Sabbath, the lamp stand of the Menorah. The seven lamps are the seven continents of the earth, the seven heavens and the seven planetary bodies known to the ancients including the sun. As noted in the Zohar, “These lamps, like the planets above, receive their light from the sun.” To the ancients, the visible solar system in the heaven consisted of the Sun, Moon, Mercury, Venus, Mars, Jupiter, and Saturn. Is it any wonder that the almond in Hebrew is lust, meaning light? Is it any wonder that more and more followers of Christ believe that Y’shua (Jesus) was crucified on a tree in which the crossbeam from whence he hanged was lashed to the tree. Is it any wonder also that many of them believe that the tree was actually the almond tree that rooted and was placed on the Mount of Olives in the days of Aaron the High Priest? About five hundred years later, Y’shua, the Light of the world, was hung on a tree near the Miphkad altar where the ashes of the Red Heifer were collected. This tree was called the Tree of Light, the Almond Tree. It was in 168 BCE; the Ruler of the Seleucid Empire of Greece, Antiochus Epiphanes IV conquered the city of Jerusalem, desecrated the Temple of the Lord and stole the Menorahs and the Temple Treasury. Josephus gives this account. "So he left the temple bare, and took away the golden candlesticks, and the golden altar of incense, and table of showbread, and the altar of burnt offering; and did not abstain from even the veils, which were made of fine linen and scarlet. He also emptied it of its secret treasures, and left nothing at all remaining. "He built an idol altar upon God's altar and slaughtered swine upon it. 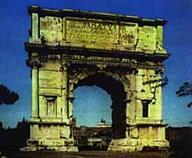 Josephus wrote that the desecration was considered to be the predicted "abomination of desolation." It was thought to be a fulfillment of Daniel's prophecy in Daniel 8:11-13. "When therefore he had carefully purged it, and had brought in new vessels, the candlestick, the table, and the altar, which were made of gold, he hung up the veils at the gates, and added doors to them. He also took down the altar of burnt offering, and built a new one of stones that he gathered together, and not of such as were hewn with iron tools. So on the five and twentieth day of the month Kislev, they lighted the lamps that were on the candlestick, and offered incense upon the altar, and laid the loaves upon the table, and offered burnt offerings upon the new altar." And so began the Festival of Hanukah (Chanukah), which was also called the Feast of Lights, the Feast of Dedication. On this day, the newly purified Temple with the ashes of the Red Heifer, was preparing for a special dedication ceremony. To their chagrin, they had only one day’s supply of oil and the preparation time for produce any more oil was eight days. The priest went ahead and lit the lamps and miraculously the lamps continued to burn for eight days on that one day of oil. Here the non-Torah feast of the Festival of Lights was begun. The Jewish families would bring out their eight lamped menorahs with a servant lamp along with the servant candle used to light the Hanukkah menorah. It was also at the Feast of Dedication that is was recorded in the Synoptic Gospels that the only time Jesus went to Jerusalem to celebrate a Jewish festival outside of his final Passover, when he was crucified, was on the Festival of Dedication. So now we have two Menorahs, the temple menorah of seven candles and the Hanukkah menorah with eight candles and a servant candle. The most miraculous is that all of these events began on the Passover that Y’shua, the Only Begotten of the Father, was crucified in 30 CE. Here in Baghdad was one of the most awesome and more beautiful of all the furnishings of the Temple. Carefully crafted on this 7 branched, 49 lamped golden menorah were 26 precious gemstones on each of the seven branches or 182 precious gemstones. Imbedded around each of the 182 precious gemstones were 200 additional priceless gemstones or a total of 36,400 jeweled stones totally encrusting the branches of the giant menorah. The spectacular and dazzling beauty this giant 49 lamped menorah cannot be imagined as the flickering lights would radiate from the multicolored gemstones encased within the gold mounting on the lamp branches as the light danced, flickered and radiated off the golden walls with shields that were engraved with cherubim. How this giant temple menorah got to Babylon is open to any thoughts of divine speculation. Whereas the Menorah in the Tabernacle was molten into one solid piece of gold, as will be suggested later, the menorah could have been constructed to have been broken down into small parts for storage and safe keeping. Understanding the full scope of these twelve mishnayots in which almost 250 Jewish underground operatives of the priestly and Levitical class were involved in the concealment and hiding of the temple treasures of Solomon, it would not be improbable that a larger group of Levites would have been involved in the concealed transport of this menorah, piece by piece to Babylon. It must be first recognized that the menorah of the Emeq Ha Molech was not the menorah of the tabernacle of the congregation, and the whereabouts of this menorah is not revealed in the Emeq HaMelekh. Yet there is one of the guardians that saw this Menorah and recorded it in his prophecies at the time of the end, the Oracles of Zechariah. It was the Prophet Zechariah son of Ido. "And the word of the LORD came to me: Zerubbabel's hands have founded this House, and Zerubbabel's hands shall complete it. Then you shall know that it was the LORD of Hosts who sent me to you. Does anyone scorn a day of small beginnings? When they see the stone of distinction in the hand of Zerubbabel, they shall rejoice. "Those seven are the eyes of the LORD, ranging over the whole earth"
Here Zechariah was seeing this Great Menorah that he already had seen when it was hid in Bagdat. It had a “bowl upon the top of it” with a ready and constant supply of oil that would never run out. Here we see a spiritual picture of the Holy Spirit, the Ruach HaKodesh feeding all the branches of the Menorah, yet the Central Lamp stand, the Ner ha-Ma’arabi, also known as the “Western Lamp” which quit shining forty years before the destruction of the Temple of Herod in 70 CE, and also known as the “Ner Elohim,” or the “Lamp of God” would be revealed as Y’shua ben Joseph ben David (Jesus, son of Joseph, son of David). The power and symbology of the 49 Lamped Menorah is to known and to be anticipated at the time of the end, when the people of the Lord see the redemption of not only of the Lost Tribes of the House of Israel and the full redemption of the House of Judah, but recognize that the Lord of hosts is preserving a literal Menorah for that day to reflect the 7 X 7 (perfection squared) of the Latter Rain given to God’s people in the latter days. We are in indebted to the Jamieson, Fausset and Brown Critical-Experimental Commentary for the following spiritual insight on a lamp that was not just a dream but one literally seen by the Zechariah, son of Ido. "And seven pipes to the seven lamps -- feeding tubes, seven a-piece from the 'bowl' to each lamp . . . lit., seven and seven: forty nine in all. The greater the number of oil-feeding pipes the brighter the light of the lamps. The explanation in verse 6 is, that man's power by itself can neither retard nor advance God's work, that the real motive power is God's Spirit. The seven times seven imply the manifold modes by which the Spirit's grace is imparted to the Church in her manifold work of enlightening the world. The seven pipes here answer to 'the seven eyes of Jehovah in the vision (ch.3:9). The seven-fold supply of oil implies the full and perfect supply of the Holy Spirit granted to Zerubbabel (the representative of the Jewish Church) enabling him to overcome all obstacles: so that as his 'hands laid the foundation of the house,' so 'his hands should also finish' (ch.4:9). Messiah alone, the antitype to Zerubbabel, has the Spirit in infinite fullness; 'for God giveth not the Spirit by measure unto Him' (John 3:34)" (volume 2, page 671). As we will see later, the articles and vessels that were taken from the destruction of the Temple in 586 BCE, there is no mention of the menorah. When about 50,000 Jews returned from Babylon seventy years later under the leadership of Sheshbazzar, the ruler of Judah, and then later Zerubabbel, Ezra and Nehemiah, there is no mention of a menorah returning to the land. The temple of Zerubabbel constructed when the Jews returned to Israel had only a faint glory of the former Solomon’s temple. It was eventually remodeled, enlarged and made into one of the most glorious temples in the Roman world by Herod the Great. 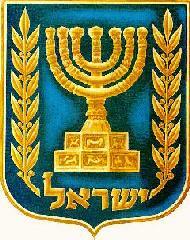 It is not improbable that one of the ten menorahs of Solomon’s temple that surrounded the Mosaic Menorah. When the Temple was destroyed, a menorah from the Temple of Herod was taken to Rome and there a representation of it was carved on the Triumphal Arc of Titus, north of the Coliseum, commemorating the triumph of the Roman legions against the city of Jerusalem in 70 CE. On the inside of the arch to the left, is a stone arch showing the transport of the Temple Menorah by the Jewish Roman prisoners. If this carving is drawn to scale, this menorah, carried on shoulder of the Jewish prisoners of war, was smaller in height of the average 1st century Jewish person. 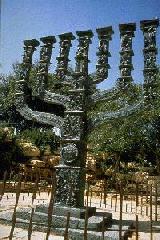 The seven branched, 49 lamped Menorah was the menorah that sat in the Holy Place and central to the temple sacrificial services. If this is the Solomon’s Menorah that stood in his temple, then the Menorah that is so vividly portrayed on Titus’ Triumphal Arch in Rome, which apparently came from Herod’s Temple, is not only different but also inferior in construction and design. Is this 49 lamped Menorah in Baghdad a special menorah and unique to the others? There is not answer to this question at present. Did this wreck really occur in the Mediterranean and are the relics of Herod’s Temple in the bottom of sea? Whereas the Emeq HaMelekh appears to be a prophecy related to the time of the end, the fate of the holy vessels, the gold table and the gold candlestick from the temple of Herod, which appeared that the Lord of host had abandoned, is still unknown. With the archeological conquest of the seas, it is possible that this ship with possibly the menorah and other temple artifacts that capsized in the Mediterranean near Carthage may be found.